Spread wax paper on a large rimmed baking sheet. Set aside. Pour the pink candy melts into a microwave-safe bowl. Microwave on high for 30-second intervals, stirring after each one, until melted. Spread the pink candy in 2-inch smears on the baking sheet, reserving about 1/4 of the pink goo. Pour the white candy melts into another microwave-safe bowl. Microwave on high for 30-second intervals, stirring after each one, until melted. Combine the melted white candy melts with the Chex Mix™, folding gently to combine. Dump the Chex Mix™ mixture onto the baking sheet, careful to drop it all around on all of the pink smears. Drizzle the remaining melted pink candy melts on top all over. Melt the green candy melts, following the procedure for melting from steps 2 and 3. Once it's melted, drizzle all over the Chex Mix™ on the baking sheet. Refrigerate for 30 minutes to set. Then, break into pieces and serve. Puke you can ... eat? Eeuw! That really IS Halloween grossness! Forget scary or cute Halloween treats. Go for something that’s more, um, gross! Chex Mix Puke is the perfect Halloween treat -- or is it a trick? Regardless, it actually does taste good, and it'll certainly amuse your party goers! To make the puke, you start with lots of candy melts, which are available at craft stores -- and Chex Mix, of course! First, melt the pink candy in the microwave and make smears on a piece of wax paper. Then mix up Chex Mix with melted white candy melts and drop it on top of the pink smears. Then drizzle that with more melted pink candy, and finish it off with drizzles of melted green candy. Don’t worry about being messy – that's sort of the point. The more unusual and random the candy patterns look, the better. You can guess why! 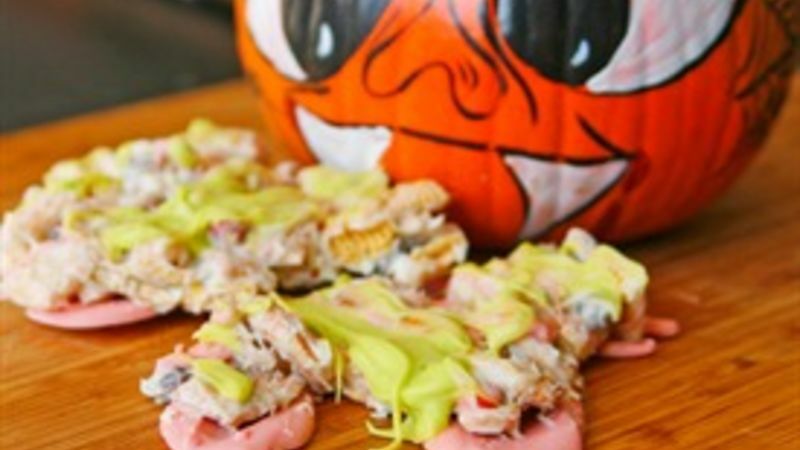 For more Halloween party ideas, see our Halloween Recipes collection. So, would edible puke be on your Halloween party table? Yes or no -- tell us below!